1. Cut desired amount of soap, and place into a microwave-safe measuring cup (each bar will use approximately 10 cubes of soap). 2. Heat for 40 seconds, then in 10 second intervals until soap is completely melted. Stir in between melting intevals. 3. Add fragrance until desired effect has been achieved. 4. Pour a small amount of clear, fragrant soap into the mold, filling the mold cavity approximately 1/3 full. 5. Place silk flower or shells (or whatever you want:) into the mold and let soap set for a few minutes. 6. 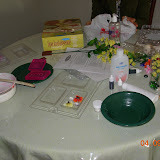 Take remaining clear soap and liquid and add liquid color a drop at a time until desired color is reached. 7. Fill the cavity with remaining soap. Be careful to pour second layer while first layer is still warm. 8. Let harden and remove from mold by applying steady...even pressure to the back of the mold. And here is the photos instead of more explanations:) Click on the photo to see the slideshow.